We brought Ryan for his chicken pox immunization last Saturday. He behaved pretty well this time. At least he didn’t cry even when the paed landed his stethoscope on his chest and back (yeah Ryan wailed like there’s no tomorrow the last time paed did that). This time round, the little fella could still stare around the office and pointed to the toy he wants to play with. Phew~~ (I wonder if it’s the doctor game we always play with him, where we will use those plastic stethoscope etc and will role play the doctor/patient game with Ryan) . Anyways, he did wail a bit la when the paed pressed and checked on his tummy. Yet to recover from his lil trauma, he then saw the needle coming, fuiyoh… there goes ‘WAH-WAH-WAH-WAHHHHH’. I think next door shop also could hear his wailing. I seriously believe his lung is as big as an adult. So loud!!! We put Ryan under MIL’s care that evening. She too has a buffet party to attend at one of the neighbour’s place but she assured us Ryan will be in good hands. There goes, hubs and I went ahead with the dinner. Throughout the dinner, I thought I almost freeze to death. I was shivering and had to leave before the whole session ended. When I got home Ryan was still awake. It’s always like this, if I don’t see the little monster for few hours I’ll have this feeling that I misses him sooooooooooo much (kekeke, not that I don’t miss him other times tho). But hey, I was sick leh. So, cannot play and quickly coaxed the lil fella to sleep. Luckily the whole episode was a bliss. Good boy. As for me, there goes my Saturday, Sunday and Monday living with the cold bug. I’m still with a bad cough and flu as I type. I just pray it won’t go anywhere near the little innocent. 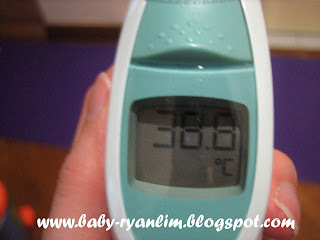 Mummy’s Temp: 38.8 when I got back from the wedding dinner. Jialat!! Mummy is no iron lady afterall. Can fall sick too.. Sob sob…. Aah.. I’m sick I’m sick. My fever was very high over the weekend and still down with a flu and cough now. Sorry, sorry ‘tui pu chi’ you may not see me leave comments on your blog for the time being but I’ll still visit you for sure….. I was surprised to see MamaBok’s message that my blog is PPP‘s featured “Blog of the Day” for 26 May 2007. Of course I’m thrilled … just not sure how it happened at the first place. Hmm.. think it was a random fluke shot. Anyways, would like to thank PPP for the linky.. If you’re reading this and am new to my blog, I hope you’ll come back ya. For my baby Ryan’s existing supporters, welcome back.